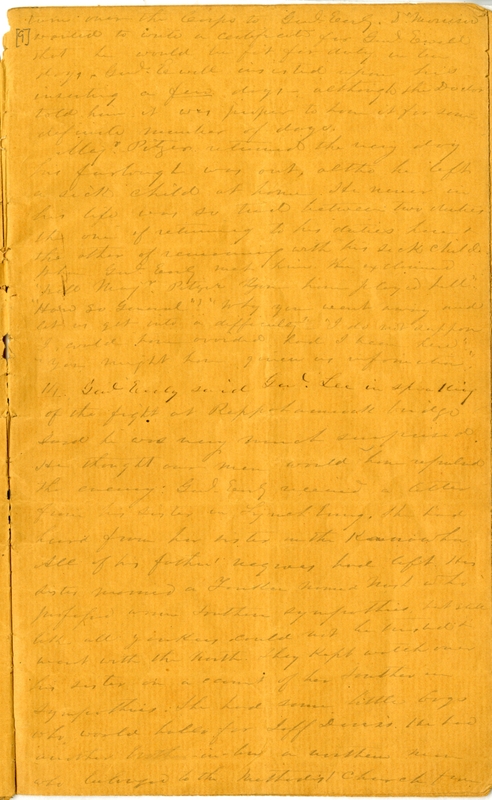 Item Description: Diary entry, 14 November 1863, written Peter Wilson Hairston (1819-1886), a tobacco planter of southwestern Virginia and north central North Carolina, Confederate soldier, and commission merchant. The entry discusses movements of the Confederate army and family life of Hairston’s colleagues. Item citation: From folder 81 of the Peter Wilson Hairston Papers, #299, Southern Historical Collection, Wilson Library, University of North Carolina at Chapel Hill. 14 Gen’l Early said Gen’l lee in speaking of the fight at Rappahannock Bridge said he was very much surprised. He thought our men would have repelled the enemy. 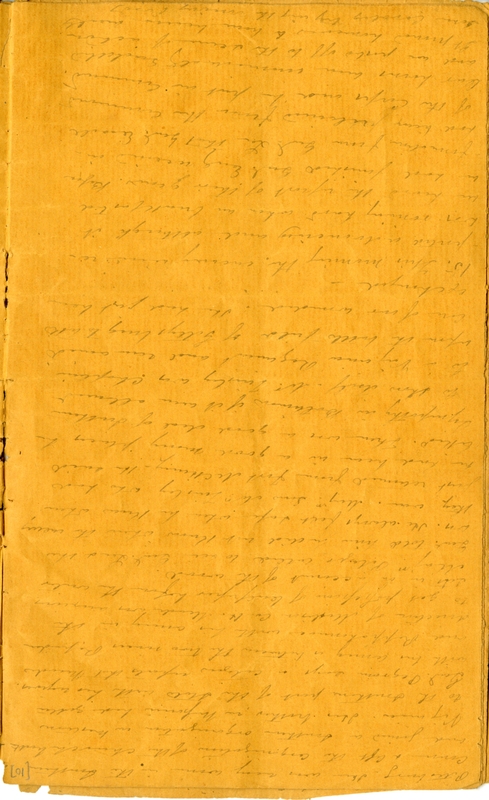 Gen’l Early received a letter from his sister in Lynchburg. She had heard from her sister in the Kanawha. All of his father’s negroes had left His sister married a Yankee named [North?] who professed warm southern sympathies, but still like all yankees could not be trusted and went with the North. They kept watch over his sister on account of her Southern sympathies. She had some little boys who would holler for Jeff Davis. He had another brother-in-law a northern man who belonged to the Methodist Church from Petersburg. He was very warm in the Southern cause and left the organization of the church … and joined a Southern organization in northern Virginia. His brother in Missouri had gotten to the southern part of the state with his negroes. Gen’l Pegram says a citizen reports that [Meade?] with his army in between the two rivers Rappidan and the Rappahannock, with his army in the direction of Madison Co. H. Meade was anxious to get possession of Culpepper before the winter sets in on account of the wood. Major Pitzer called to see Gen’l Lee. The Gen’l told him he did not know where the enemy was. He always felt safe when he knew where they were. Major Sam, Wm. Tinsley, who had just returned from Fort McKinney, he said he had been in a good many places he liked. There was a good deal of Southern sympathy in Baltimore if it were allowed to show itself. Mr. Tinsley was chaplain to a Virginia regiment and remained upon the battle field of Gettysburg to take care of our wounded. He had just been exchanged. 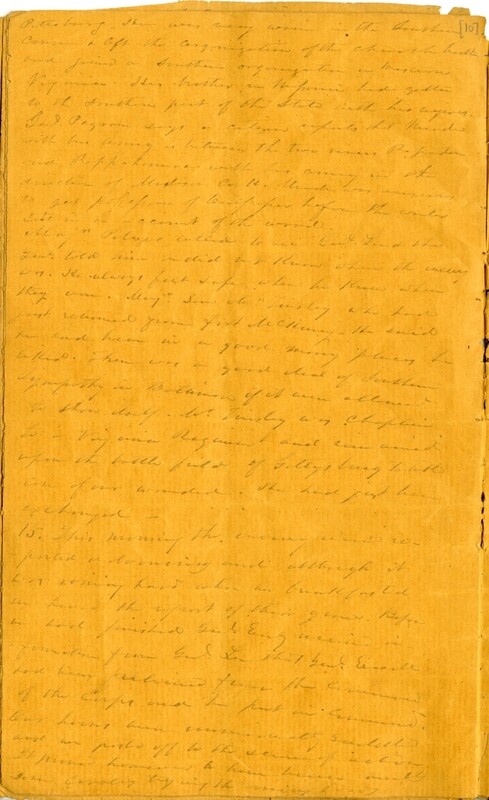 This entry was posted in Southern Historical Collection and tagged Confederate Army, diaries, Peter Wilson Hairston. Bookmark the permalink.